Jay Leno has made his “history test” a regular feature on his show. He supposedly chooses people at random (I wonder if it’s all planned) and asks them various questions on historical topics. It’s amazing and embarrassing what people come up with for answers. Society has several reasons for the public’s low retention rate of historical information. Some say it is the teacher’s fault for teaching straight from the text and it’s just too boring. Some say curriculum has been watered down while others say the curriculum is too rigorous. Some say too much emphasis is put on certain events in history such as the American Revolution and the Civil Rights era while ignoring whole sections such as the War of 1812 or the Korean War. Well, it seems that the United States isn’t the only country who has citizens who are illiterate as far as historical data. 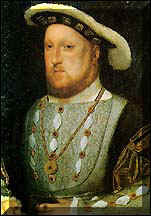 The Brits are easily confused as well according to Alan Coren in his article “How Henry VIII Lost the Battle of the Bulge, and Ofsted Went to War” published in The Times (December 28, 2005). You can see the entire article here. The Chief Inspector of Schools in Ofsted claims that students in Britain are historically illiterate because the curriculum over emphasizes the Tudor Era and World War II and that students are unable to remember key dates or major events. The reasons for her remaining the Virgin Queen were that the only two blokes to get anywhere near her were Essex and Raleigh. She turned the first one down because it was better to be called the Virgin Queen than the Essex Queen. She turned the second one down because, although he got rich after inventing the bicycle, he was stingy, and only ever gave her fags or chips, neither of which she could get the hang of. Chips made her cough. In the reign of Henry VIII, the second most important man in England was Cardinal Wolseley. He not only invented the police car, he also designed the engine for the Churchill tank. This was to play a major part in the Battle of the Bulge, so called because Henry VIII, who had originally planned to lead the English armoured brigade into battle, made the mistake of having lunch first, and was unable to squeeze himself through the hatch. They are the six wives of Henry VIII. After the fall of London, he took them all up on the roof of his Hampton Court bunker and shot them, to stop the Russians giving them a seeing-to. Notice the mangling of details between the Tudor era and World War II. At least these students made an entertaining effort instead of writing “Beats me”, “I don’t know”, or the ever popular sincere apology. “I’m sorry Mrs. 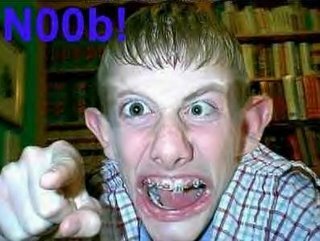 Elementary History Teacher. I didn’t have time to study.” I would be tempted to at least give students points for creativity and for effort though. Note I said tempted….not that I would. At the fourth grade level students write about the content they are learning. I do this to emphasize to students that writing is not just for Language Arts. I also feel that by writing about what they are learning they can make connections on their own and retain the information better. At their level I have to give them lots of support and usually have to give them a strong idea of where I want them to go. We do a lot of writing together in the beginning before I can release them to compose on their own simply looking at their notes. I don’t test using the essay format. Most of my testing is multiple choice and short answer response. I sympathize with the high school and college level educators who do need students to construct elaborate responses to questions like those above. Recently in a post titled “I Love My Job But…”, A History Teacher advises about the extraordinary amount of time it takes to grade student essays. Twenty plus hours! My hat is off to you. I spend many hours grading papers but grading compositions is extremely tedious even when I devise a rubric. As a history teacher and especially one that introduces the discipline to students I am bothered by mangled history. How does it happen? Why does the public have a collective dislike for the subject? My students seem enthused so at what point does apathy take over? I need to ponder this more. Try out your knowledge of history by taking a quiz here. I reaffirmed myself by earning a 100. My seventh grader received a digital camera from her generous aunt for Christmas. She loves it. She used up the batteries in 5 hours the first night she used it. Finally her darling daddy went out and bought her rechargeable batteries----we decided it would be cheaper in the long run. As of today she has amassed many pictures, figured out how to store them on her own, and has downloaded them to the myspace site we allow her to keep. This is a self portrait with three of her friends. 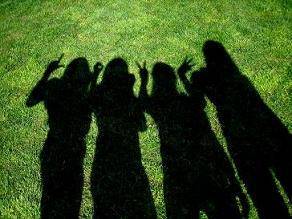 I love how she took a picture of their shadows. Notice how the girls have spelled “love” with their fingers. Young folks can be so creative when you just let them be. This morning on CNN I saw an interview with a woman who was telling parents to not allow their teens to have a Myspace site or any other type of website. I agree for 90% of those out there. I have seen several of the sites my former students maintain. Oh my gosh….the language, the pictures, the information they so freely put out there. We have also had a problem in my school district with students slamming each other on their sites. I blame parents for this. So many kids are online with no controls whatsoever. Are we surprised? Most children watch television constantly----the only control they have is the remote control. We visit my daughter’s site constantly, her 20 year old brother and his friends visit her site constantly, and her grandparents have visited her site. If there is anything questionable we see it. The computer she uses is in the family room----not in her room. From time to time I have had to tell her to take down a picture or delete some content, but for the most part it has been ok. She has her site blocked and no one can send her a message unless they are on her approved list. The great thing about these sites is the communication they can provide. When I graduated high school I lost touch with so many people. We split up into hundreds of different paths and over the years we lost touch. My son was a member of a great group of friends in high school. They are still in touch----three years later----sometimes daily through their emails and Xanga sites. They can support each other when they have had a bad day and applaud their accomplishments. Though I have visited the sites of some of my former students I would never contact them through their sites. It’s just too risky to be accused of something. I have had former students email me through my school email address and I always answer them, but I also always print out their message and my reply and keep it in a file. Gee...that's kind of sad that I have to constantly think about liability issues, but educators really do have to think through every situation. I don't want to be the lead story on the 5 o'clock news. Now here’s a student any teacher would be proud to have….. I have no idea who this is. I just wanted to depict an average student on my post so that non-educators out there would see what they are missing every day. The new Thursday Thirteen hub can be found here. 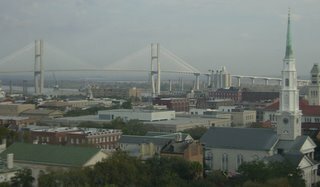 I recently returned from my all time favorite city in Georgia.....Savannah. Savannah is the first city of Georgia. It is the spot where James Oglethorpe came ashore in 1733 with 114 settlers to begin the Georgia colony. Of course, Oglethorpe's experimental idea of a debtor colony would eventually fail as greed took over, but it was a noble idea. Savannah is where Forrest Gump and Midnight in the Garden of Good and Evil were filmed. The city where anything is accepted....as long as it's done politely. I was in Savannah with a few of my colleagues to attend the GCEL Conference. GCEL stands for Georgia Compensatory Educational Leadership. The group supports Title I funding and promotes the success of various Title I programs such as ESOL and Remedial/Intervention type programs. Various schools present strategies and programs they have found success with. I feel we represented our school and the money spent to send us to this conference well. We split up and we each attended 8 presentations in two days for a total of 24. I have been busy preparing a powerpoint to present our information we gathered to our faculty at a meeting tomorrow. Savannah has always been a favorite place of mine to visit. I get excited knowing I can walk on the same spot where Oglethorpe first landed at Savannah and where he pitched his tent as he was marking off the simple square design of what would become the first city of Georgia. I can walk by the very balcony where LaFayette spoke to the citizens of Savannah. I can eat at the Pirate's House which was once a nefarious tavern where pirates hung out. It is believed they d used underground tunnels to smuggle kidnap victims out to their waiting ships. I can take a carriage ride past some of the beautiful squares of Savannah and walk down the cobblestones of River Street. While on River Street I can dine in a converted cotton warehouse that is 270 years old while I watch modern cargo ships several stories high sail past heavily laden with cargo containers. The powerpoint I prepared for the faculty meeting is pretty good. I filled it with our data plus padded it with pictures we took of each other and some of the sights we saw. I showed it to my homeroom today and discussed all of the places we saw and their significance. They were most interested in the picture I took of the candy store on River Street since I bought them saltwater taffey there for them. They were also fairly disinterested in the picture I had of Armstrong House until I told them that the owner of the Georgia Bulldog mascot, "Uga", is a partner of the lawfirm that is housed in Armstrong House today. No, I didn't get to see "Uga", but I was just steps away. We had just finished up our colonies unit before I left for the conference so I was able to actually show them many of the things I had previously told them. It made for a nice impromtu history lesson. I am leaving Sunday morning to travel to Savannah, Georgia to attend a teacher's conference. I am looking forward to going but have been bogged down with sub plans and other assorted things to do all week. It was nice to come home and read a few of my favorite blogs to read. I was most entertained while I read an interpretation of how many dogs it would take to install a lightbulb over at Kibbles n Whine. It was a howl! emails to send, copies to make.